Have everyone form a circle holding hands around a large trash can. 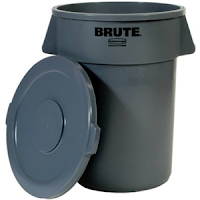 The object is to get others to touch the trash can by pulling on their hands without touching it yourself. Anyone who makes contact with the trash can or unlocks hands is eliminated. Last one standing wins! This can be played as a big, long elimination mixer or as a game with 5-10 kids. It can also be played outside with a kiddie pool full of something unpleasant (water, mud, jello, etc).